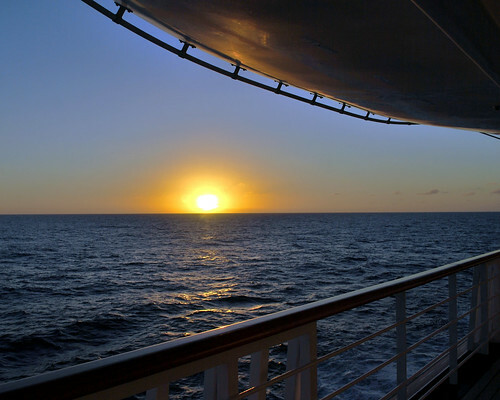 I thought I'd start this post with a picture that I got from the pages and pages of photos that Sandee's handsome hubby Zane took during the cruise. He actually took pictures of people whereas I mostly took people of places and things so I've snitched a few (with permission of course!) to "flesh" out my posts here and there. This shot above was actually taken while we were still in port in Miami shortly after Barb and I had met up with everyone on the Lido Deck and before I got pretty weirded out for the rest of the cruise. I'd had the pleasure of meeting both Sandee and Zane twice before on trips to California but it was fantastic to see her again. 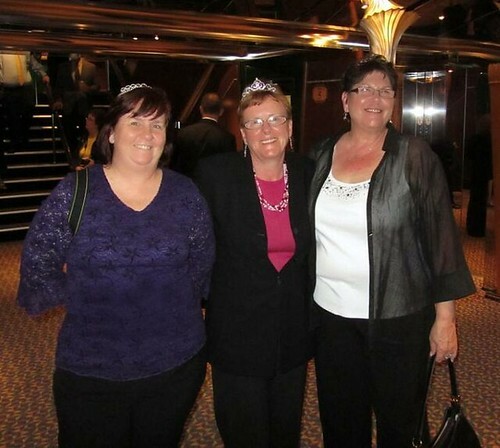 She and Zane had an absolutely fantastic time and, unlike myself, can't wait to get back on a cruise ship again! Of course, what else would one expect from a Commodore?? The shot below was definitely taken after dinner when we'd left the 5-star restaurant (it costs $30 each for dinner but it was SO worth it only if to be treated like royalty by the staff!). 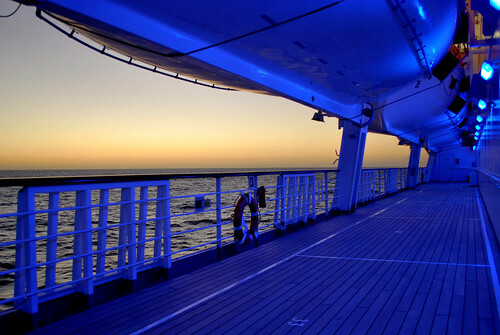 I guess we were there longer than I thought we were as when we came back out on deck, the Lido Deck was darned near empty and the lights had all come up. This is looking towards the fore of the ship from aft ... like how I learned all of the nautical directions?? Being the ever-exciting social animal that I am, I believe I went back to my cabin after this and went to bed early while everyone else went to go see a show or to the comedy club. I don't think I did a single late night on the cruise but that's okay because it meant that I could get up early and take pictures while no one else was about! 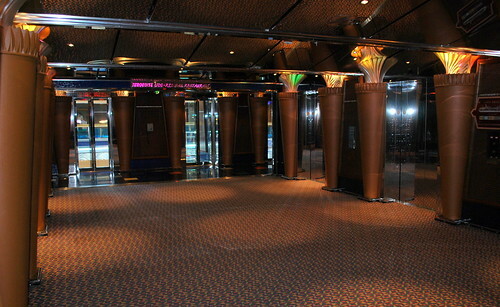 For example, these are the elevators on the Lido Deck that Barb and I used - a lot! I couldn't seem to get a shot of the deck layout without light issues but I wanted to post this as Barb found these guides to be quite helpful once she noticed that they were there! 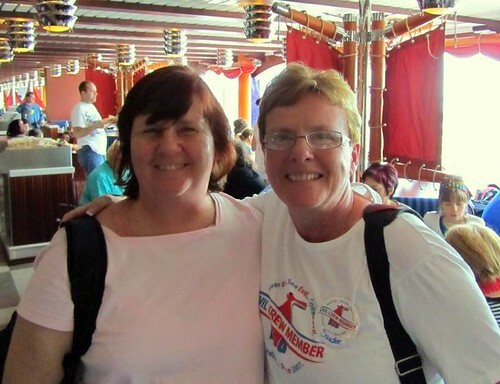 My poor cabin-mate always seemed to be turned around as to which direction was which so I think she needs to go back and practice on another cruise! 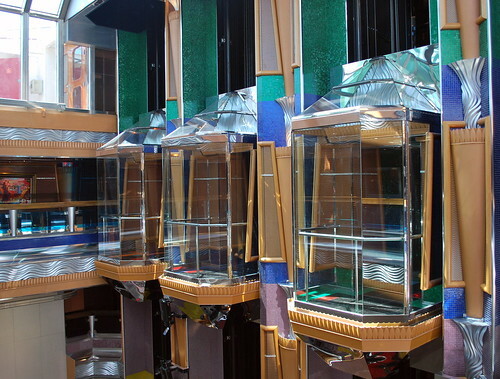 This is just a quick shot of the glass elevators as I was heading out towards the open deck so I could try to get a picture of the sunrise ... whew! Almost missed it! For the shot above and the shot below, I was on Deck 10 Aft and as you can tell, there was basically no one else around as they were all sleeping. For me to be up at sunrise when I don't have to work is pretty unheard of but I was enjoying being out and about early for some strange reason. 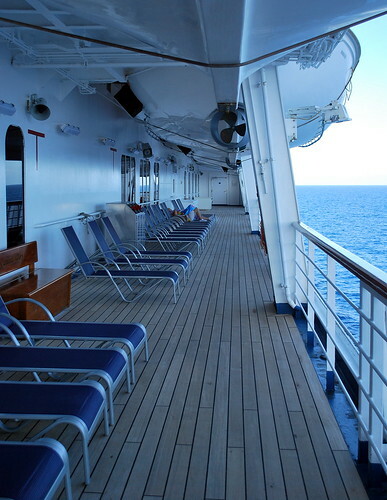 And of course there HAS to be a picture of my most favorite place on the ship - Deck 3 Starboard where it was usually just me, a lot of empty deck chairs, and the lifeboats. In this case there was one other person out there but that's okay, I know how to share! 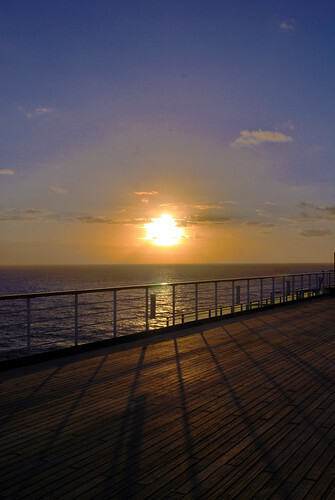 Everyone tells me that you generally find a favorite spot on the ship and stick to it and for me - this was it! 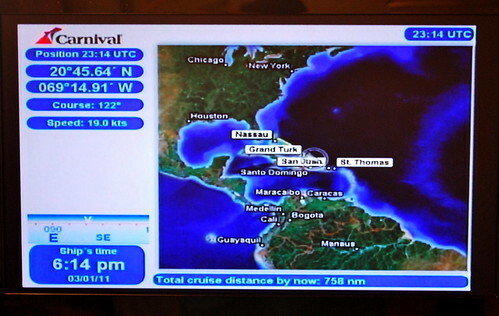 The rest of the day was spent at sea doing "fun" things what with Carnival being the fun ship and all! Barb and I went and played a musical trivia game and then we played a single game of Bingo where she managed to walk away with the singular $600 prize - yay, Barb! We celebrated with a Bloody Mary out on my favorite deck! Later in the afternoon we went to a "Bloggers' Tea" where John Heald himself served up tea (Earl Grey, please!) along with pastries and cucumber sandwiches. It was all quite civilized and, once again, I forgot to take pictures! If you're interested you can check out a video of Tea Time over on YouTube if you'd like and you might even get a peek at a few of us that were there but just a quick peek! Following tea I decided that it might be a good evening to get some pictures of sunset being that I had managed to get some of the sunrise but in order to do that I had to skip dinner with everyone else in the dining room as sunset was right about the same time. I figured I could just order from Room Service after I was done taking pictures being that I had heard so many wonderful things about Room Service on the ship. Heck, I'm all for letting someone bring me dinner on a tray! First, though, pictures were needed so it was back down to my favorite deck! I have absolutely no idea who the couple in the picture above is but it's one of my very favorites being that I am a bit of a romantic fool and love seeing people in love. Not that it doesn't depress the ever-lovin' beegeebers out of me being that no one loves me that way but I do love romanticism in all of its ways, shapes, and forms. And really, isn't that just a great shot?? As for the rest of the pictures, they speak of a solitariness to me, especially with the fading light of evening, but considering that's how I was feeling I think that they most definitely captured my mood. There's just something about the vastness of the ocean to make you feel small in the world and watching the sun set over the Atlantic definitely made me feel small and alone and maybe just a bit melancholy, too. However, I was actually quite good with that so it wasn't a bad thing. 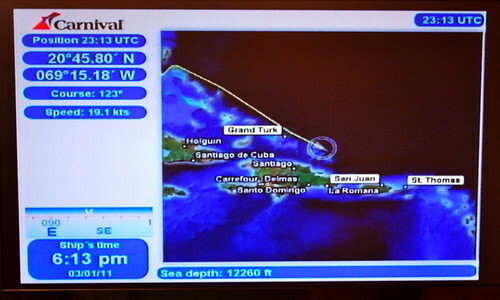 Going back to my cabin to order that much-anticipated Room Service which ended up being a darned good BLT made with the most bacon I've ever had on a BLT anywhere, I checked our TV to see where we were in the vastness of the ocean. 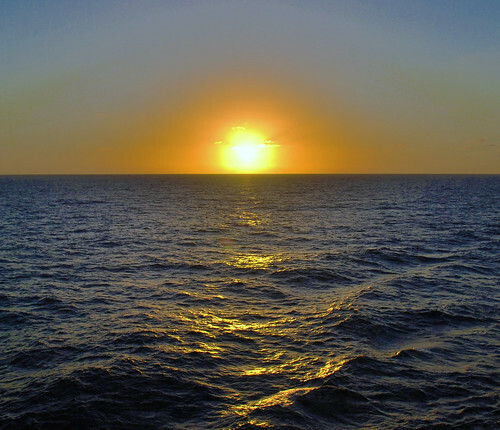 A Navy friend of mine had told me before I left on my cruise to not worry as I would never be more than two miles from land ... straight down ... but in looking at the sea depth I realized that he was wrong as we were definitely over waters more than two miles deep! Thanks for the comforting words, Gary - not! Following my tasty dinner, I decided to venture out of my cabin (gasp!) 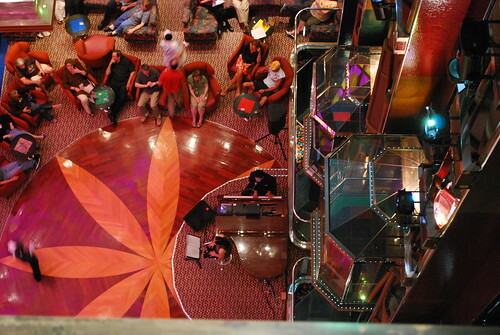 and go join the people down in the Deck 3 Lobby where there was usually someone performing. Barb and I had sat down there on Sunday evening and listened to a duet that I quite liked as we watched couples dancing on the small dance floor. I had really enjoyed watching the couples dancing as it's something that I always wished I could do myself though it's kind of hard when a) you're uncoordinated and b) you don't have a partner! Still, I thought it might be nice to head back down and grab a chair and a drink and listen to the music so I did. First, though, a few more pictures! 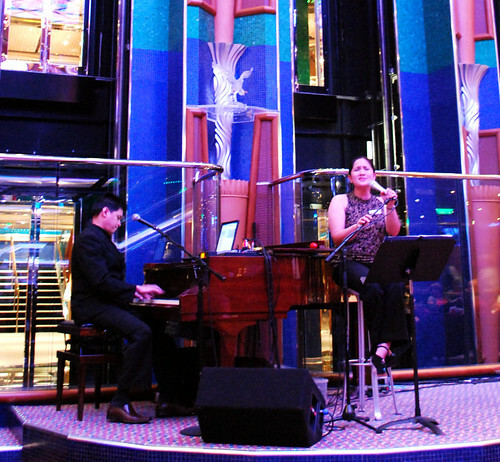 I never did find out their names but this is the duet that I liked; they performed a lot of songs that I hadn't heard in years and the female half had a voice very much like Celine Dion or someone like that. She was quite good as was her partner but the main thing I remember about him was that he always said "Ah, thank you!" after every song! While listening to them I also treated myself to a very tasty Tiramisu Martini but you're not going to see a picture of it - imagine that! Trust me, it was delicious and was a nice end to a nice evening at sea. OOH, a tiramisu martini? That sounds yum! 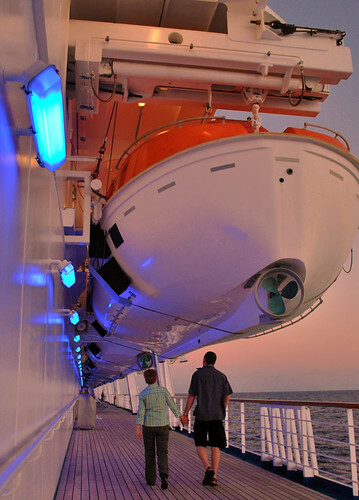 I love the lifeboat deck, too! It's the closest you can get to the water. I like to see the white foam aagainst the dark sapphire of the ocean. You got some great shots Linda and you look lovely all dressed up for dinner! 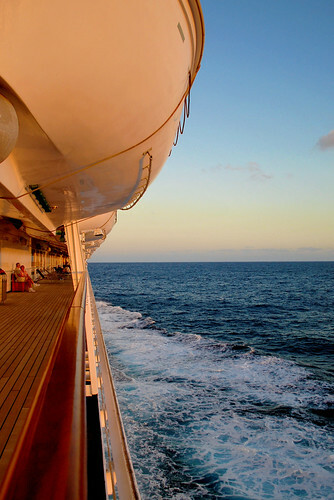 I was up at 6 am most mornings on our cruise to enjoy the sunrise with a cup of green tea - best part of the day for me. I love the evening shots on the deck. The colors sooo make me want a NIKON. 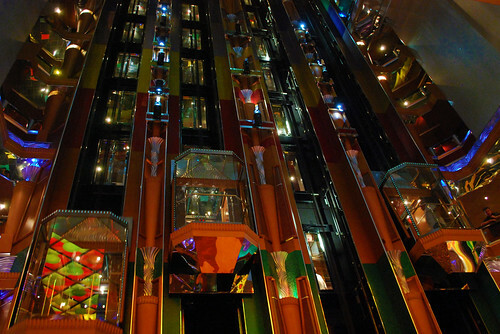 Love the night shots of the lobby and elevators, sooo cool. 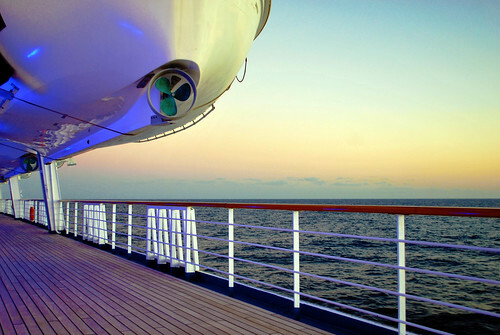 I do not think I would be much of a cruise person either, but for the right destination, like alaska. WOW! It's like I'm right back there, and I SO wish I were! 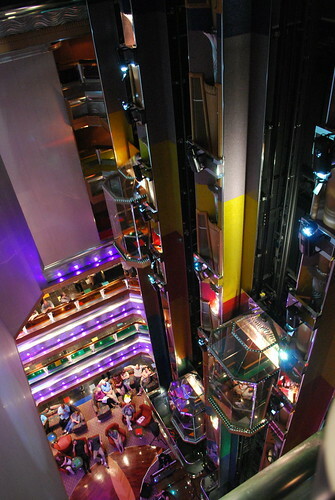 Love the elevator shot! I tried to get something similar but my camera just is NOT capable. 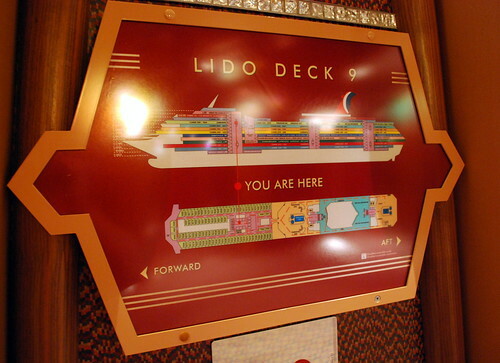 The "You are here" signs definitely saved me much walking and considerable time on the second half of the cruise when I was not with you - you, who always knew exactly how to get everywhere! I know what you mean about being a romantic, but after 17 years single, I've managed to suppress all melancholy... most of the time. 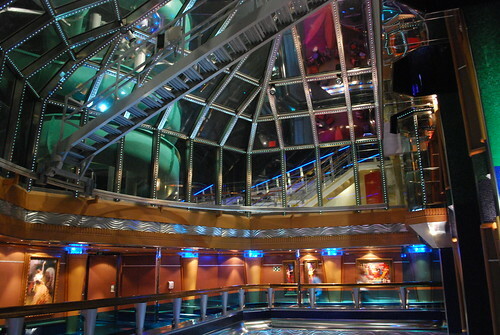 The ship looks deserted in most, like the Marie Celeste! Great shots Linda and you are welcome to any shots that Zane took. They are there for anyone that wants them. 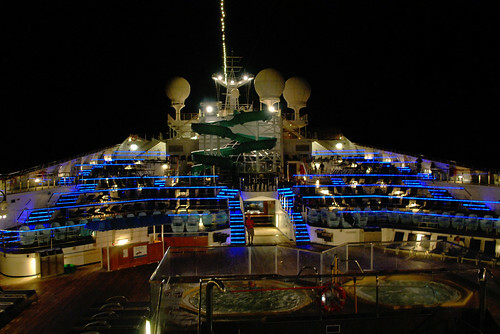 I did have a great time and Zane and I have talked about our next cruise. 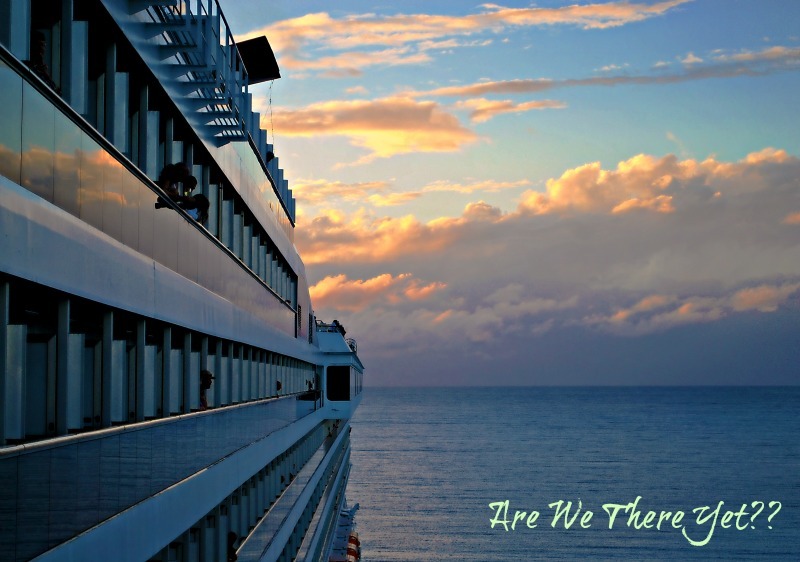 We aren't sure where we are going, but there will be a next cruise and another after that. @Bee - please don't feel responsible, I really did have a good time just not THE time that everyone seemed to think I should have. 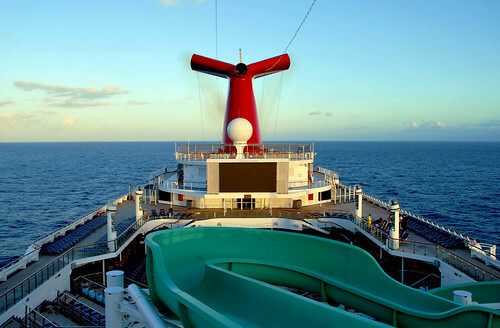 I may not have been head-over-heels about cruising and I'm not chomping at the bit to do it again but I'm not saying I'll never ever go again either. Maybe just a smaller ship with less people? @Dianne - Thank you but I think I just did what any good friend would do and that's offer love and support to another. With Patti, that's very easy to do! Ooo, that looks like so much fun!